Let's just take a second to appreciate how incredible this bomber jacket is! This little beaut trend has basically been rocked by every single style icon who is relevant in the fashion world right now. They started off the casual fashion trend with the bomber jacket and Blue Vanilla is helping us all achieve the look. The jacket is literally perfect for this season, as it’s light enough so that you won’t get excessively warm if the weather picks up but can look amazing layered over an outfit to keep you warm. You can easily rock this look as you go about your day running errands and will still look fashionable. 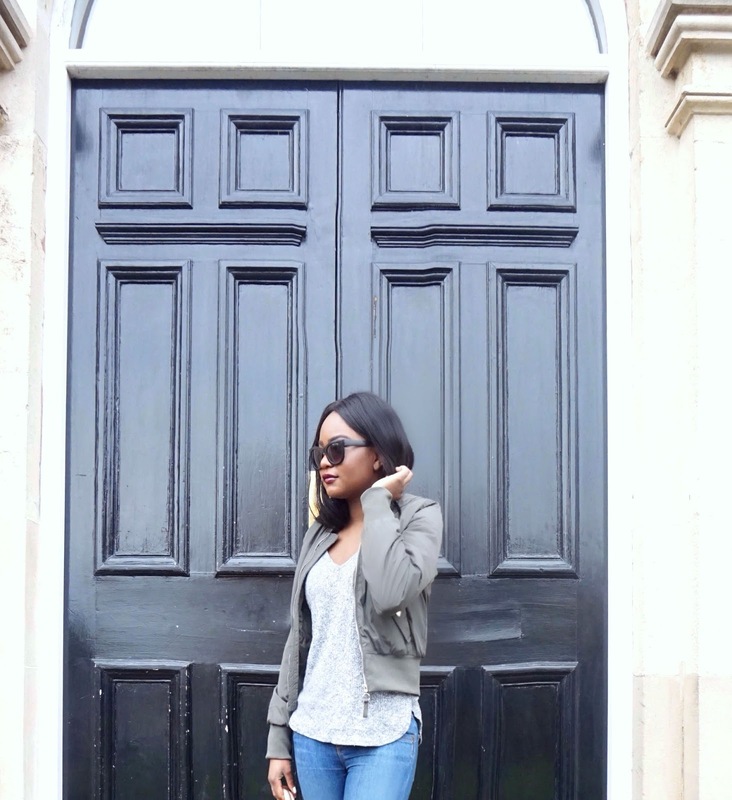 I styled my look with some basic pieces, I’m wearing a basic grey top, some casual jeans and simple court heels here. The point of this look was to emphasize the fact that you can basically wear the simplest of clothes underneath and the bomber jacket will elevate your outfit from simple to chic in a second; it’s definitely the star of your outfit. I also cant express enough how comfortable this jacket is to wear and as an added bonus the fabric also feels amazing. I’ve really wanted to get a bomber jacket for the longest time now and hadn’t because it’d taken me ages to find the right one as I knew instatly after spotting it that it would look great on me. I’m glad that I have one now and in this colour especially, because afterall … khaki is the new black. Random fact thrown into the mix here for you all but I’ve even spotted on Instagram/Tumblr that some pages are dedicated to purely posting style looks that feature khaki pieces, because everyone literally obsessed with it (have a cheeky search on Instagram/Tumblr, you’re guaranteed find a page or two easily). I think the beauty of this jacket is also the fact that the sky is the limit with it (stylewise). You can wear it like I did in this post or you can even wear it with the sleeves pushed way up, over a slip dress, and with some trainers. In an effort to try something else you can even pair the jacket with a midi skirt and crop top; ultimately everything in your wardrobe! Whatever your pick, one thing still remains crystal clear, the bomber jacket is a must-have wardrobe essential. Get yours here. I love your blog! Your top/jumper is beautiful, where's it from? I love your jacket, those shoes will look great !! I love the jacket! Beautiful look! I'm loving bomber jackets as well. You're killin' it in this look! 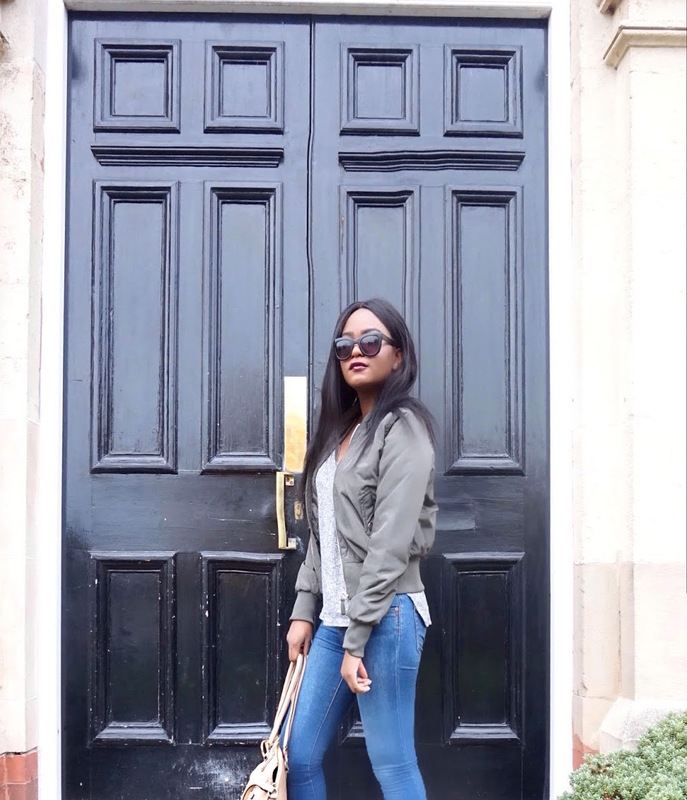 Love the bomber jacket, it ties in perfectly with the rest of your outfit.